Here are some of the small Ad’s and Logo\Branding I have done for real companies. All were created while I was attending School. Although I’ve done some Graphic Design since taking Computer Animation in 2000, going back helped me push my artwork and design work much farther. These few examples I think are a good show of this. I volunteered my time to help with this new business. 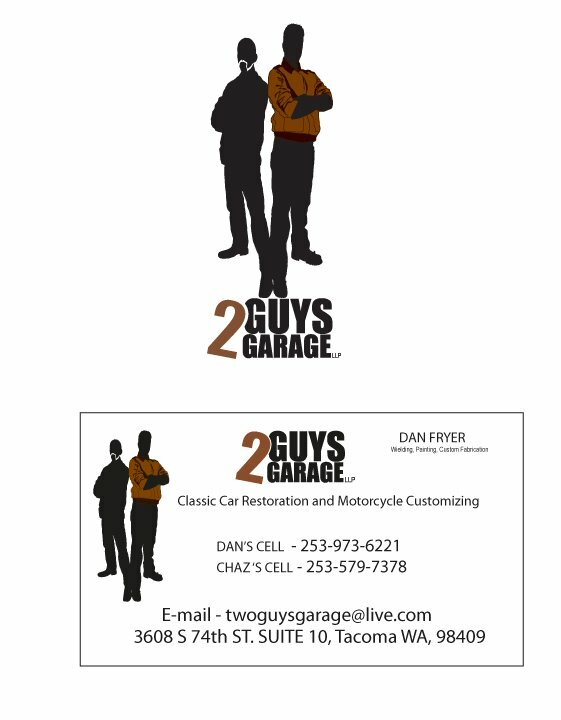 It was a two color branding experience where I got to create the logo, business cards, signs and anything else they needed. I took photo’s of the two guys in a few poses, then using the strongest photo and Illustrator, created a silhouette of them both. I found the two unique physical qualities that truly of captured each person at a glance and created the symbol. The Logo works with the symbol on top or next to their name or even dropping it completely if need be. This was a lot of fun and a great learning experience. You don’t have a chance often to have such free-rain and create everything from scratch. I redesigned this for a company that was next to 2 Guys Garage. They had a very flat fully black design. I turned the R’s into each other, gave a slightly different font and added the red. The logo went over very well. After the approval of the redesigned logo I created new cards, which had been printed on plain white, black type, and no real pattern and/or rhyme or reason of the placement of the information on the cards. They had a lot of info and not a very good layout. I took pictures of the owner’s car to show what he could do at a glance, and worked with the placement of type and added a little color. 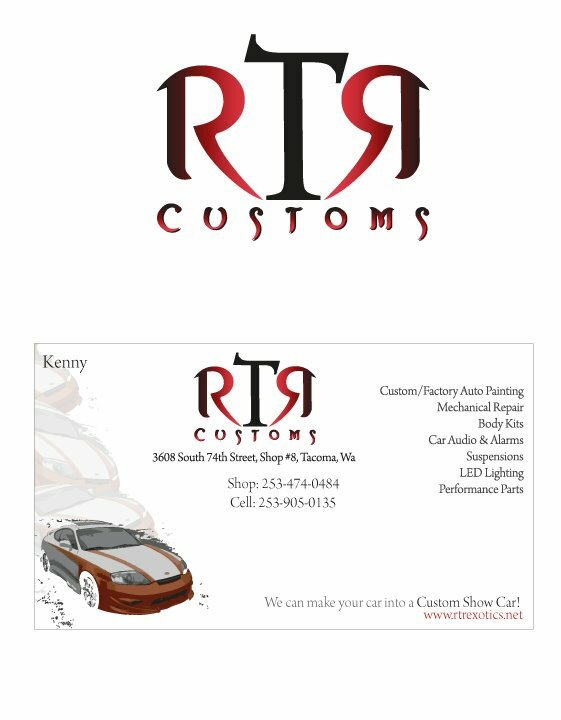 It was enthusiastically excepted, but I had to decline the sale and use of this project with RTR customs; however, I was very pleased with the finial design of this business card. I did this for a friend. She had a basic idea but nothing really to start from. 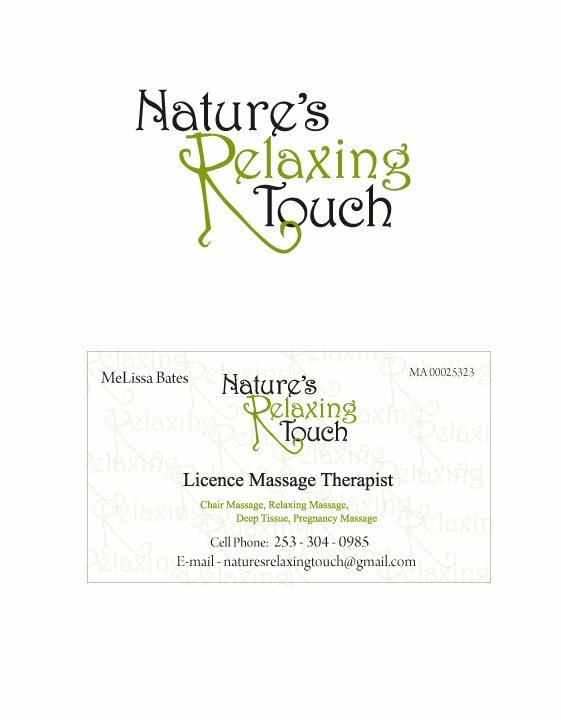 I did not want to go the same route as most massage therapist’s do for logo’s. I wanted her’s to stand out without the typical look or a baby, flower, candles or other well known relaxation posses for a lot of massage companies. Instead I stayed to a two color brand and worked with her logo name only. I wanted a flowing beautiful type that also could give that relaxed feel. The R in relaxing is a different font and looks very relaxed, where as the others look very beautiful and all work together. Again, I used only a touch of color on the card to bring your eye down to what she offers. The new design has gone over very well at the conventions she has gone to and was a hit with her, which is the number one objective. I was hired by Discoverypoint to redesign an ad for them for the Natural Awakenings magazine. 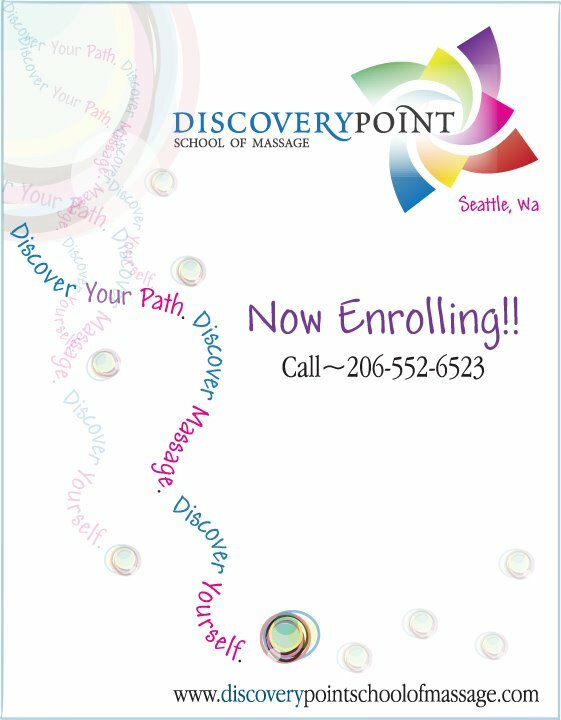 Discoverypoint wanted a fun colorful ad that not only gave the information they were looking for, but also added to the spirit of the school. Using only the colors found within their logo, I drafted a new advertisement to convey their message and put life into the school. I used Illustrator for this project. I used indesign to create this and the sister project, including the artwork to give the eye a brake from the text. 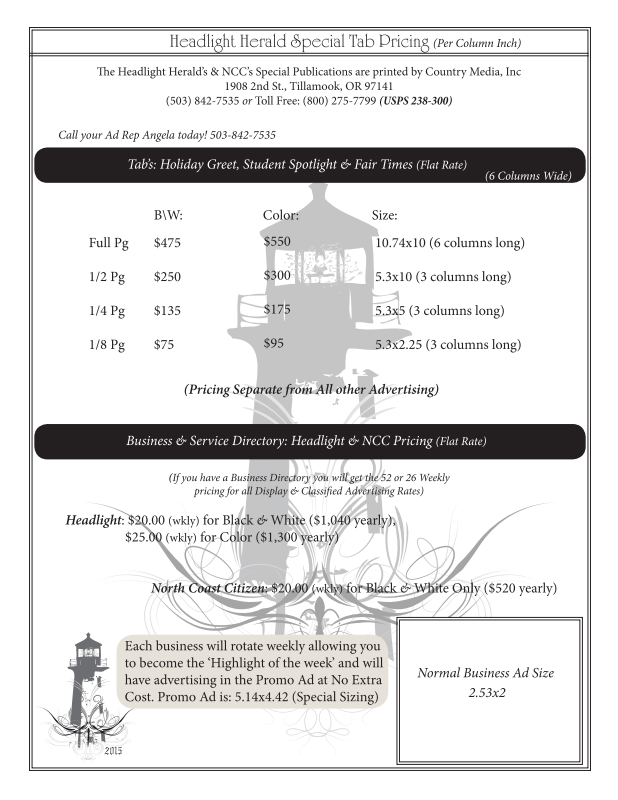 When I was working here, and in the spirit of creating a packet to show clients, I created this new price guide. Sadly this initiative was unrewarded. However, it was a chance for a nice change to use my creative skills in a different way. I did not use any logo’s or type from this company, I had used all new layouts. The only thing that was theirs was the common knowledge pricing that would be pass out to any client. I just wanted to post an opportunity of more diverse skills that I believe this and the sister project show. This is the sister project. 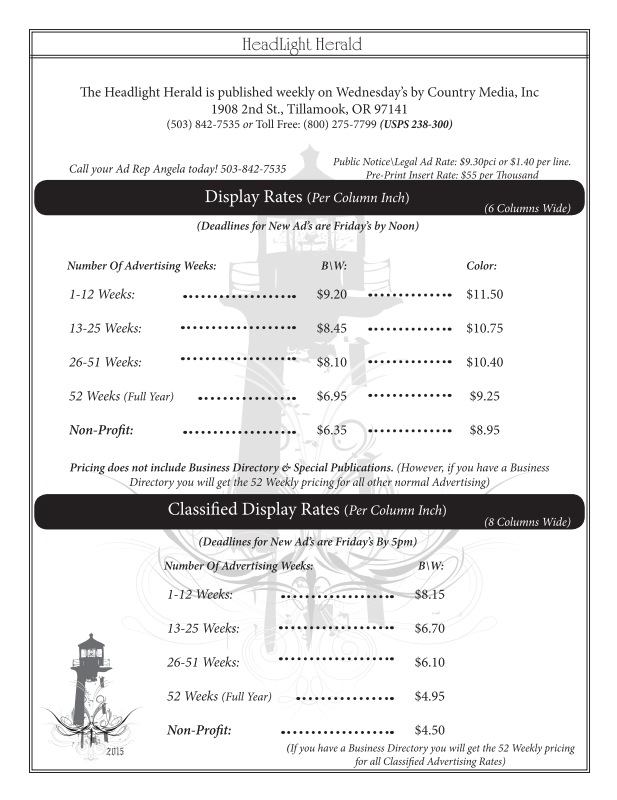 A price guide for the more common tab and updated business section which had never existed. Although I did enjoy this re-creation, I wish it had been a little more rewarded.